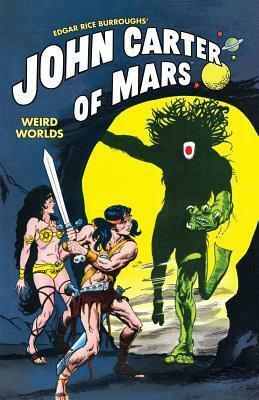 Most of the stories here are adapted from Princess of Mars and Gods of Mars. They’ve been shortened and the ending of Princess of Mars was skipped in order to take John and Tars Tarkas straight into the Valley Dor. There’s about one issue worth of original stories. The original issues came out in 1972 and 1973. I was at first disappointed by how little original stuff was in them but on the whole, the stories are well adapted for a comic form. They do downplay the relationship between John and Dejah to instant love, which is wasn’t (quite) in the book. In the end, I liked the collection but probably won’t be reading it again. 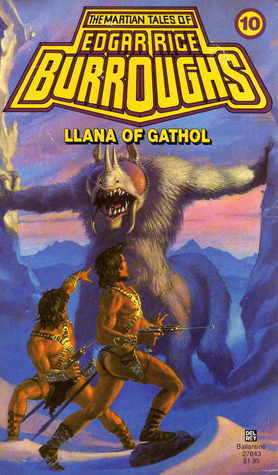 11th book in the Barsoom series. This story was published originally in four parts but they form a whole. Storywise, this feels like a culmination of many of the tropes Burroughs used in his earlier stories; they’re all used here. A kidnapped gorgeous woman, new cultures which have stayed hidden until now, the main character putting on some new leathers as a disguise, vile villains, and heroic heroes. Yup, it’s a Barsoom book! The narrator is once again John Carter. He’s come to visit Edgar on Earth and tells him a story about Llana, his granddaughter, although she’s not the main character, John is. The story starts when John is looking for adventure and solitude. When he’s flying above Horz, one of the biggest dead cities of Mars, he sees a group of Tharks attacking a red man and he has to help. Together John and his new friend Pan Dan Chee kill all the Tharks. However, Horz isn’t dead after all: a hundred warriors come appear and take John captive. It turns out that Pan Dan Chee and the other warriors from Horz aren’t red Martians but have white skin and blond hair. They are of the ancient Martian race which people think have died out. They have been hiding out in Hortz and don’t allow any outsider to live. Their jeddak is sad but resolute; he must condemn John to death and Pan Dan Chee, as well. They are sent to the old dungeons. In their further adventures, John encounters his granddaughter Llana who was kidnapped by a too-eager suitor but escaped. Naturally, John tries to take her home to Gathol. This is, of course, not easy. 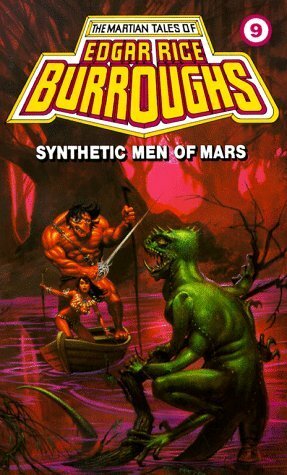 This is actually a pretty good representation of the Barsoom series, full of adventure. Apparently, these were written as a parody of Burroughs’ own previous works. It is quite remarkable how none of the bad guys recognize John even when he has shown his remarkable strength and fighting skills and even openly told people that he’s from Jasoom. Unfortunately, it also has the same problems as the previous books: very black and white world where the good are beautiful and the bad people are easy to recognize on sight. Good guys also get along very well. Enjoyable, if you like that sort of light reading. Llana is actually pretty good female character even though not as independent as her mother Tara. But she doesn’t really have a chance to shine; most of the book she’s off-stage. We’re told that she’s good with the sword but she isn’t given a chance to use it. 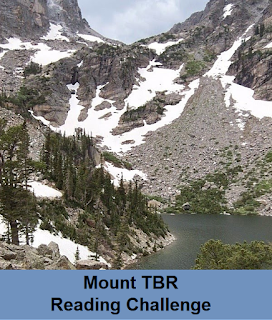 The ninth book in the series. The incomparable Dejah Thoris has been in a flier accident and was injured terribly. Helium’s best doctors can keep her alive but not cure her; only one man can do that: Ras Thavas, the Master Mind of Mars. But he has disappeared and John Carter leaves Helium to search for him. His friends and family (clearly remembering previous times…) plead him not to go alone and he takes with him one man from his guard: young warrior called Vor Daj. Together, they fly towards Ptarth where Ras Thavas’ erstwhile apprentice lives because they hope that he has some clues to the great surgeons’ whereabouts. However, (and extremely fortunately for our heroes) their miraculous compass is just a bit off and the flier takes them near the Toonolian Marshes which is rumored to be full of savages. Strange creatures take John and Vor Daj captive and transport them on the backs of huge birds to the city of Morbus. The strange creatures are hormads and live in Morbus. They are vat grown red men (and indeed all seem to be male) who are grotesque and hideous in appearance. They’re also slow-witted. The most intelligent of them have formed the Council of Jeds and have imprisoned Ras Thavas and forced him to work for them. The hormad jeds intend to conquer whole Mars with their rapidly grown synthetic men. They aren’t good with the sword but because they can’t be killed, the jeds intend to just grow so many of them that they will take down everyone else with sheer numbers. This time the narrator is Vor Daj. Early on, he sees a beautiful girl and falls in love with her. The girl, Janai, is also imprisoned in Morbus and Vor Daj wants to free her. In order to do that, he realizes that he has to put his brain into a body of a hormad so that he can be near her and protect her until he and John figure out a way to escape. So, he asks Ras Thavas to do that and the great surgeon agrees. So, Vor Daj’s body is hidden while he starts his adventures in a horribly deformed body. Of course, things go wrong and soon Vor Daj is in danger of losing his real body. He also keeps his real identity a secret from Janai, fearing that she will forever see him as a hormad. The hormads are an interesting invention. Their bodies and faces are usually twisted; one might not have legs and another might have an ear growing in the middle of his face. Yet, they’re unkillable; parts just go on moving and a new body can be grown to a head. They can only be destroyed with fire. Vor Daj meets another new culture which is a described as a group of primitive savages. They are not tharks nor red men but marsupial Martians who hop around with their tails and hind legs. In contrast to the other Barsoomians, they don’t show bravery in war but instead only attack when they have overwhelming numbers on their side. The hormads are imaginative and quite horrible in their desires. The most intelligent ones want red men bodies and force Ras Thavas put their brains into the bodies of captured red men. So, it’s not possible to know who is who. The book even has a little philosophy about it. Unfortunately, there are some sloppy errors in the book. 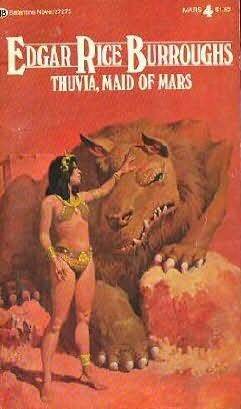 The worst of them is perhaps the mix up with two characters but the ending is also less satisfactory than the other Barsoom books because we don’t know the fates of the major antagonists. They can be assumed but we don’t see them. Also, even though the Martians spring fully grown from eggs, which we are told in this very book, there is a slave boy in this book. Still, this is a very imaginative book and worth reading if you’ve enjoyed the previous books. This time the main character is Carthoris, John’s and Dejah’s son, and the tale is told in third person. The titular Thuvia is also a point-of-view character but she has far less screen time than Carthoris. She was introduced in the previous book, just like Carthoris. She helped John escape from the land of the dead by commanding the fierce Barsoomian lions, the baths. She’s also the princess of Ptarth. Carthoris is in love with Thuvia and apparently he started to woo her at the end of Warlord of Mars, but he didn’t make his intensions clear and so Thuvia’s father promised her to his heroic friend and ally, the Jeddak of Kaol, Kulan Tith. Since Thuvia is honorable to a fault, she honors her father’s promise and spurns Carthoris. He returns to Helium with a heavy heart. However, another man is also determined to have Thuvia: Astok, Prince of Dusar. He kidnaps Thuvia, but is cunning enough to lay the blame on Carthoris. He has also sabotaged Carthoris’ compass so that Carthoris disappears around the same time as Thuvia and can’t defend himself against accusations. Both Thuvia and Carthoris end up in the ruins of the ancient city of Aanthor in an unexplored (by red men) part of Mars. There, they encounter the Lotharians who have focused on their mind in order to survive. They can create fearsome bowmen and even food with their minds alone. However, they are constantly besieged by the green Martians and so they’ve come to believe that they are the only civilized people alive on Mars. They have hard time believing that Carthoris and Thuvia are even real. Oh, and all the Lothrian women and children are dead so it’s literally a society of very long-lived adult males. Their jeddak has forbidden them to conjure images of women or children. They have two factions: the realists who believe that they need to imagine meals in order to continue living and the etherealists who don’t even image meals anymore. Both stay alive. The device that Carthoris has developed is quite ingenious considering the time the book was written. It’s essentially an automated pilot and it can also sense when some obstacle is near and goes around it. This is another fun romp and I think that Thuvia is slightly less passive a heroine than Dejah. Thuvia commands the banths and she even uses her dagger to defend herself. 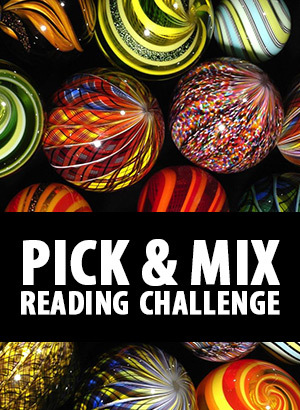 Of course, a modern reader can find lots of objectionable things in this series.